Si viajas en familia, el vagón cubierto es divertido para todas las edades. I went on the horseback tour, my wife went on the covered wagon, we were both very happy with our experience. 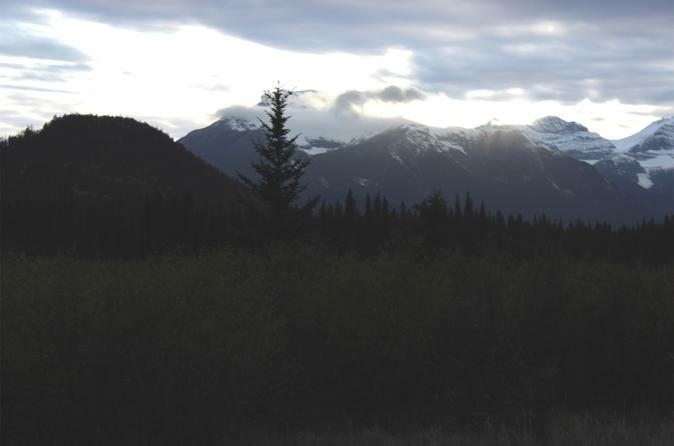 The horseback trail follows the Bow River and the views at sunset were Absolutely Breathtaking. The cookout was good, the staff was excellent, the ride was just enough of a terrain challenge to make the ride an adventure, and the views were jaw-dropping. Saw some mule deer and a herd of elk as a bonus. If you like horses and being out in unspoiled nature, don't miss it. Very relaxing travelling along the river bank. The staff were friendly and informative and the BBQ was excellent - plenty to eat and the steak was superb. We had the opportunity to try lassooing. Although the weather wasn't the best, we were given blankets to keep warm. Went on a day that was pouring rain. Found staff a bit rude, came for the tour and was treated like intruders. Beautiful scenery. Lunch was okay. A relaxing ride taking in beautiful scenery as you go. 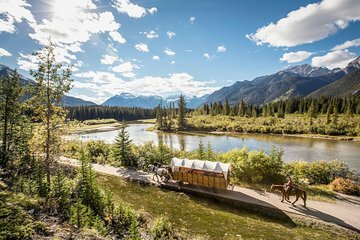 Unfortunately it had rained heavily in Banff before our BBQ but we were lucky we had opted for the Chuck Wagon BBQ as the trail taken by the horse riders was very muddy. The BBQ food was just ok but our guide in the Chuck Wagon was excellent telling us stories about the area during our ride. Terrific experience! The staff was very professional, the scenery beautiful and the lunch yummy! Would totally recommend it to others. I loved this tour! Jenny our wagon driver was full of info and humor, the lunch was amazing and everyone was so friendly! I really enjoyed the ride. It was a little late taking off, and we were caught in a major downpour on the way back to the stable. The lunch was very good. Brilliant hack for all levels of experience. This was the first time my husband had ever been on a horse and he had as good a time as I did. The horses are all fit and well cared for. They're friendly - affectionate even - and all fitted with power-steering (rein trained). The outriders are professional, experienced and friendly. We rode through some wonderful scenery on a circular route. Lunch was a superb BBQ of steak, salad, jacket potatoes and beans. Playtime with Horseshoes was fun too. I heartily recommend this trip to anyone - experienced or rank newbie; you WILL have fun! My husband and I rode in the wagon. GUIDE COULD HAVE PROVIDED INFO ON AREA, WILDLIFE ETC. TALKED TO ONE PASSENEGER ALMOST EXCLUSIVELY ABOUT HERSELF. It was very uncomfortable. we were prepared for the flies from a pevious review. Our grandaughter rode the horse. most of ride was on gravel. Dinner was edible - not really good. Meat overcooked. Was REALLY not worth the price.